VOKRA - All Life is Precious. All life, whether it is human or animal, is precious. I fostered a pregnant cat named Cookie two months ago. She came to me with a very full belly, yet seemed only a year old kitten herself. She had a very delicate face and frame, and seemed to have difficulty moving around because of her pregnancy. Every day, as I pet her, I nervously looked for signs of labour. 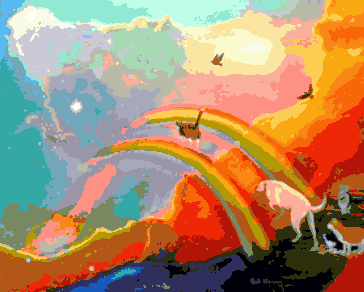 I felt her kittens move in her belly, I felt her purr as she approached labour, and when she did give birth, I was there to witness five beautiful and tiny kittens squirm and mew for the first time. It was one of those moments in life—when time slows into a graceful waltz and you realize just how profound and how precious life is. 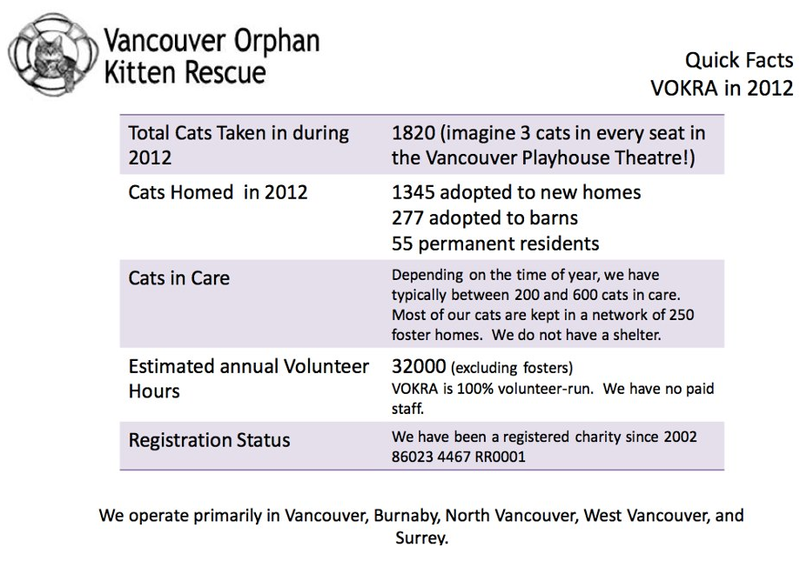 Volunteering as a foster for Vancouver Orphan Kitten Rescue Association (in short, VOKRA) was one of the most life changing and rewarding decisions I have made. Vancouver Orphan Kitten Rescue Association started out with two founders - Karen Duncan and Maria Soroski. Their goal was to provide a different solution to manage homeless or unwanted cats. Rather than have them put down for unjustifiable reasons, they decided to rescue, rehabilitate, and re-home abandoned or feral cats. From rescuing 150 kittens and cats to taking in 1820 cats in 2012, VOKRA has grown exponentially. The organization is driven 100% by volunteers and donations—there is no government funding - et VOKRA continues to be successful in its journey to protect lost, unwanted, and homeless cats with the help of dedicated fosters and volunteers. Fostering and volunteering can be hard work at times. Sometimes, rambunctious kittens decide that shredding toilet paper will be their entertainment of the night. Feral cats can be terrified of humans and make rescue very difficult. Abandoned cats form colonies and their numbers multiply very quickly. No matter how hard we try to save them, some cats and kittens pass away to disease or failure to thrive. Despite all the difficulties, the volunteers and fosters at VOKRA continue to do everything they can to give each kitten and cat a fighting chance. Kittens are bottle-fed and cleaned, feral cats are tamed, and they are all lovingly listed on the VOKRA website to be adopted by forever families. It is because at the end of the day, when we send them off in their carriers with their new family, we know that they have found a great home. We know that there is one less kitten or cat out there, lost, scared, and sick. 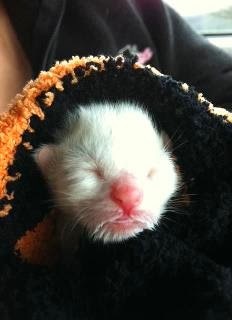 For more information on VOKRA or how to be involved go to www.orphankittenrescue.com.